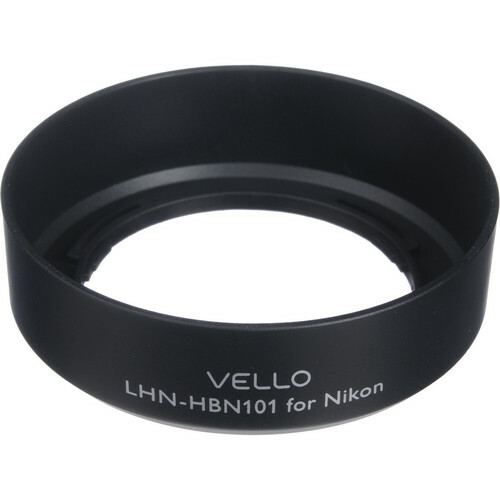 The dedicated Vello HB-N101 Lens Hood is specifically designed for use with Nikon's 1 NIKKOR VR 10-30mm f/3.5-5.6 lens. It is primarily used to prevent unwanted stray light from entering the lens by extending and shading the end of it. A dedicated hood is crafted to perfectly suit the specific focal length of the lens it is designed for. Additionally, this hood features a non-glare matte finish on the interior surface to further prevent or limit lens flare. Also, since the end of the lens is extended, you get the added benefit of some extra protection from accidental impact. Box Dimensions (LxWxH) 3.4 x 3.4 x 1.5"
HB-N101 Dedicated Lens Hood is rated 4.7 out of 5 by 3. Rated 5 out of 5 by AAP from Worked great Worked great on my 10-30mm Nikon 1 lens. I have not tried the official Nikon version but this alternative worked great for me. Rated 4 out of 5 by Michael B. from It's a lens hood. Don't expect miracles. Elegant? No. But it gets the job done, and given how often I lose these things I'm fine with paying less. Is this hood reversible on lens for storage just like the real Nikon HB-N101? The Vello HB-N101 Dedicated Lens Hood can be reverse mounted on the 10-30mm for storage.